THE FRAME is a beautiful display designed specifically to bring a room to life even when it is not in use. When someone turns the TV off, rather than going to black, the display goes into art mode. THE FRAME is the first sensor-based display that adapts to its environment throughout the day with automated brightness and presence capabilities. When no one is in the room, the display turns off entirely. 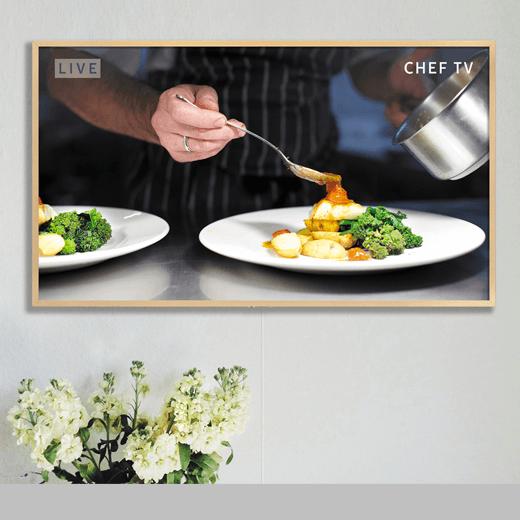 The bezel of THE FRAME can be customized from materials chosen by the owner to blend the display into their home décor. Designed by: Yves Béhar, IDSA, fuseproject design team, and Yunje Kang, Sangyoung Lee and Sungjun Ann of Samsung Electronics Co., Ltd.